Based in Kintore, Aberdeenshire eGroup are the largest company of its type in Scotland. They specialise in preparation, testing, cladding and fabrication (its eFab division having been founded in 1976 as RIM Fabrications). With their new logo and brand identity in place we were asked to provide a quote for external signage to really bring an impact to their office and extensive industrial complex. With their newly designed logo already locked in, eGroup were looking for durable signage with a high quality finish. They needed the signage to be secured to the outside of their various production and office buildings as well as on printed directional internal signage. Having designed, proofed and delivered the brand new signage. The next task was to arrange fitting. This was done quickly and efficiently, with little complication apart from some difficulty fitting to a corrugated surface which was quickly overcome. The new signage looked fantastic and really represented the growth that eGroup were keen to build upon. We were asked to continue our relationship and quoted for van and vehicle livery. We were excited to continue working with the eGroup team and our designers developed vehicle mock-ups and delivered the resulting work in great time. 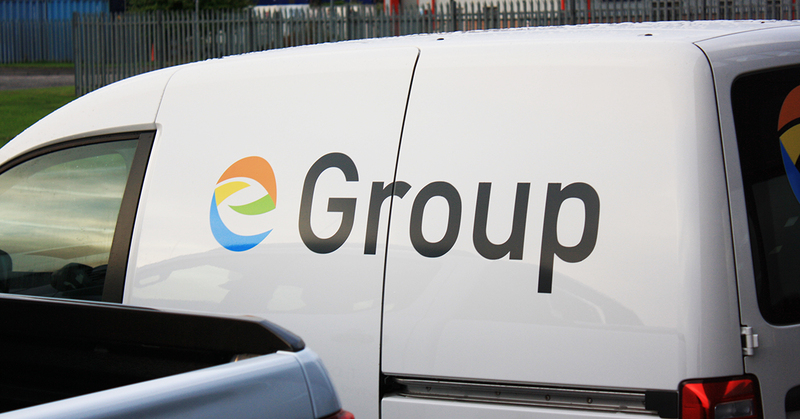 While we didn’t design the logo we think it looks great both as featured signage and on the fleet of vehicles that carry out the day to day tasks for a company as established as eGroup. Additionally we provided a wall vinyl for reception to tie together the full eGroup experience and a football pitch advertising board installation at the Colony Park Football Club ground in Inverurie.